After her father died suddenly in 2004, Quynn learned much about her father that she never knew while he was alive. He never talked about his time in the Navy, or his two tours that involved combat and death. For years he drank alcohol and retreated from the family. After a long time of estrangement, Quynn was able to reconnect with her father two years before he died. Much was healed at this time. After his death, she realized how strongly her father’s war experience affected her family, that she knew she must write about her experience. She wrote “Accepting the Ashes” to share what she learned about loving someone who is suffering from PTSD, as well as her experience of healing, both her father’s and her own. Accepting the Ashes shares one family’s story in the hopes that other veteran families might not have to wait 30 years before they heal their emotional wounds caused by the trauma that can be caused by war. 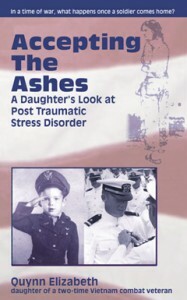 You can find out more about this story, how it is helping veterans and loved ones around the country, and to order the 60 page illustrated pocket book go to www.acceptingtheashes.net.